DENVER, Dec. 8, 2017 /PRNewswire/ -- Timely and accurate weather forecasts can directly affect public safety and protection of property; and the next satellite in the NOAA GOES-R Series will continue to provide more data for sharper, more detailed views of weather systems. NOAA's next weather satellite in the Geostationary Operational Environmental Satellite – R Series, GOES-S, left its Colorado home where it was built and is now in Florida where it will undergo preparations for launch from NASA's Kennedy Space Center. Monday, Lockheed Martin (NYSE: LMT) shipped the next-generation satellite aboard an Air Force C-5M Super Galaxy cargo transport plane to its Astrotech Space Operations facility in Titusville, Florida. GOES-S is scheduled to launch on March 1, 2018, when it will join its sister satellite, GOES-16, in orbit. GOES-16 has already proved vital in forecasting and is a dramatic improvement of weather forecasting speed, accuracy and detail over the previous generation of satellites. "Our team understands the important mission of this national asset especially after the year of severe weather that our country experienced," said Tim Gasparrini, vice president and GOES-R Series program manager at Lockheed Martin Space Systems. "Progress continues with this second satellite in the series and we're focused on performing the final tests and readying the satellite for a successful launch." The second of four next-generation geostationary weather satellites, GOES-S will be positioned over the West Coast at 137 degrees west longitude once operational. The data from the whole constellation will support short-term weather forecasts and severe storm warnings, maritime forecasts, seasonal predictions, drought outlooks and space weather predictions. Additionally, the technology will improve hurricane tracking and intensity forecasts, and increase thunderstorm and tornado warning lead time. Lockheed Martin designed, built and tested the satellite and is responsible for spacecraft launch processing. GOES-S will launch aboard a United Launch Alliance Atlas V 541 rocket from Cape Canaveral Air Force Station in Florida. In addition to all four GOES-R Series satellites (R, S, T and U), Lockheed Martin also designed and built the Solar Ultraviolet Imager (SUVI) and the Geostationary Lightning Mapper (GLM) instruments that will fly aboard each spacecraft. NOAA funds, manages, and will operate the GOES-R Series satellites. 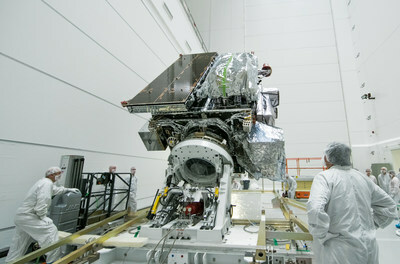 NASA oversees the acquisition and development of the GOES-R Series spacecraft and instruments for NOAA. The program is co-located at NASA's Goddard Space Flight Center in Greenbelt, Maryland.